...Inspired by reading a near-future SF novel where the near is becoming progressively "nearer". I can easily imagine that soon, the technology of "Halting State" won't be so far from our own. But what happens when the present does catch up with the imagined future, with the date of that future... or simply with a date at which that future itself looks outdated? It's clear that some novels are still successful despite (and some even partly -because- of) this, whereas others prove easily dated. 1984 is long gone, 2001 saw very few space odysseys (to say nothing of 2010), but neither Orwell nor Clarke will fall off our reading lists any time soon! Part of this, I think, is generality, and in this I think softer SF tends to persist better. It latches more onto the fantasy end of the market: views of technology might be easily outdated, but we still want to explore views of humanity - or even just views of a particularly interesting character. 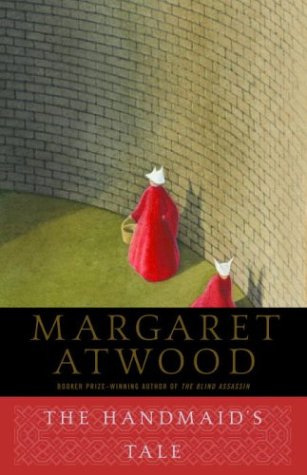 The Handmaid's Tale, for instance (though I don't recall whether its epilogue ever set an exact year), I can imagine being read for a long time to come. Regardless of if we use credit cards (which the text mentions), or - I don't know - chips embedded in our fingers (wait, that's horrible, but still), her dystopian vision will still be relevant. While the worldbuilding is always interesting, if a tale doesn't stand as something other than exposition, there isn't much to it - I can imagine a lot of the near future crime SF sticking around. What about the view of technology itself? Well, it seems to help to defy the current aesthetic: if a novel is just one of hundreds of 70s SF novels all espousing the same vision of the future, it'll date quickly, especially when we reach the set date of said future, and it's completely wrong (meanwhile, there's always room for a quirkily different vision, even if wrong!). As always, it's the different ideas which stand out - whether socially or scientifically. Lois McMaster Bujold's Vorkosigan series will be around for a while: plenty have thought up similarly space-operatic futures, but the societies she places in these futures are endlessly inventive. Neal Stephenson's Snow Crash (which popularised the word 'avatar') easily stands out from its cyberpunk lookalikes with the franchised USA setting (plus a hefty dose of amazingness. Protagonist as pizza deliverer for the Mob, anyone?). Thirdly, a lot of the novels which stick around are simply lucky. Nobody can avoid being influenced by their time, and their contemporaries. Just look at the parade of fiction which used nuclear physics as a general do-anything tool, just because it was new! But exactly which of these similar novels or stories ends up defining that time period in the present day is often due to luck, or popularity (I guess there's also an element of which best fits current values as well). ...don't worry, I don't have any particular point in bringing this up - I just think it's interesting to think about which SF novels have stuck around, even when their technological predictions are hopelessly outdated. Any you particularly think will stand the test of time?